It's time to kick the Christmas spirit up a notch! All the stockings are hung on the fireplace and the tree is meticulously decorated and topped off with an angel. Of course, there's a wreath on your door and some mistletoe in your archway. 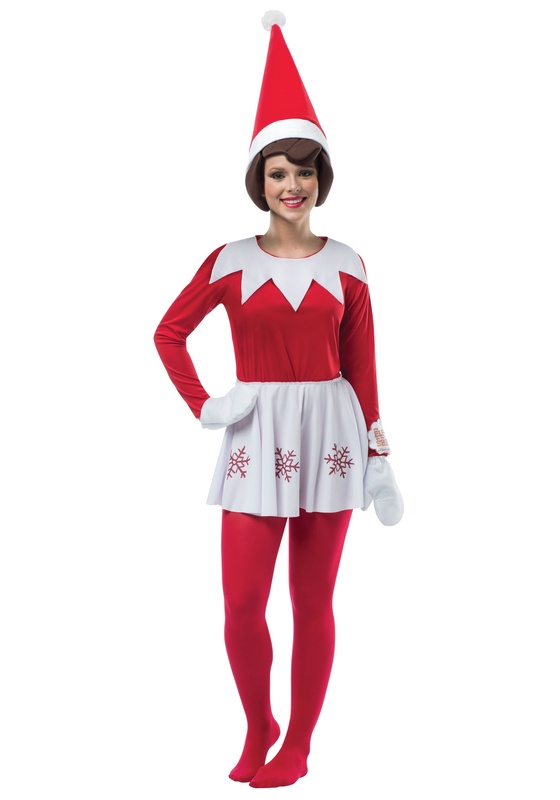 It's plain to see that you and your family take Christmas very seriously in your household and we'd like to help you elevate your yuletide experience by supplying you with this Elf on the Shelf costume. Sure, Uncle Rick coming down in a Santa suit every year never fails to disappoint, but the kids will really topple over with laughter if mom dresses up as one of Santa's "scout elves." Help countdown the days to Christmas by playing a daily game of hide-and-go-seek with your children. Wear this costume and hide in the house and have the kiddos come and find you. It will become a Christmas tradition they'll remember forever. This officially licensed costume comes with a matching shirt and skirt combo which radiates holiday cheer. The soft shirt features an attached collar while the coordinating skirt showcases a beautiful snowflake pattern. White mitts and a pointy hat topped with a pom-pom complete the look. All that's left to do is scout out potential hiding spots. Oh yeah, there's also presents that need to be wrapped! You're going to be a very busy mom this Christmas, but what else is new?